If you want a ground cover thyme that works to fill in fast, then choose Caraway Thyme (shown above creeping all over a plug tray). Scented like a Caraway seed, Caraway is one of the few thyme ground covers that has a fragrance. It has deep green leaves that are set about a half inch apart along reddish stems. Caraway Thyme is a pretty rampant grower and should be used where space is not an issue. It blooms mid spring and is nice when planted with a swath of a later blooming thyme like Coconut Thyme. Just make sure to put the later blooming thyme in front and a respectable distance from the swath of Caraway Thyme. Caraway Thyme can be used as a substitute for real Caraway in any recipe. It is especially nice in bread or cooked with meat. The species name herba-barona translates herb of beef and refers to medieval times when herbs were frequently used to spice up meat that had gone just a wee bit past its expiration date. 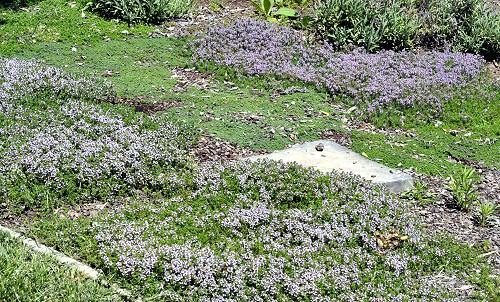 The Caraway Thyme (plant blooming in foreground) is only one year old and has rapidly filled a large space. The Heretus Thyme (blooming in the rear) is four years old and has spread to about a third of the size. The non-blooming thyme in the middle is Elfin Thyme. This plant is often available in plug trays. These trays hold 128 of all the same plant. They are a great low cost way to fill a lot of space. Each cell is 3/4 of inch by an inch. 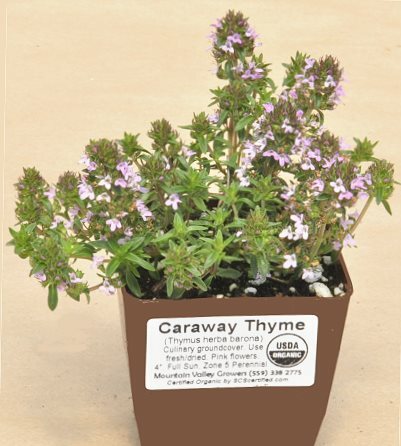 Check here to see if Caraway Thyme Plug Trays are available.